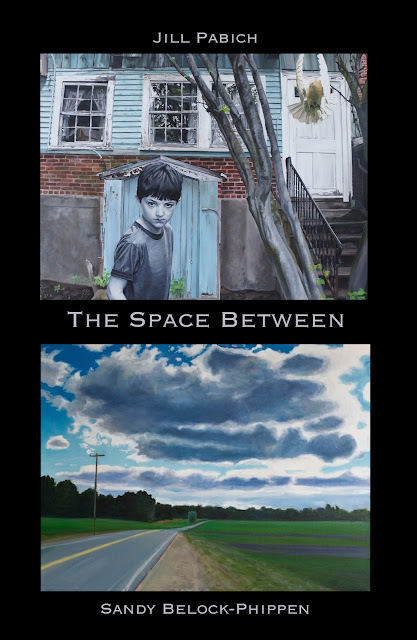 The Gallery at Porter Mill is pleased to present our August exhibition The Space Between, featuring the paintings of Sandy Belock-Phippen and Jill Pabich. Beverly based artists Sandy Belock-Phippen and Jill Pabich create paintings that are compelling and iconic in their imagery and technique. The works shown here share a sense of immediacy and spontaneity and a highly individualized sense of color and spatial relationships. Belock-Phippen’s current work focuses on the constantly changing, nuanced landscapes of New England and beyond, which serve as springboards to explorations of the ephemeral: light, color and the emotive quality of place. A fluent, tactile handling of the medium is striking in all the pieces. This passionate commitment to the medium is a strong visual link to Jill Pabich’s work. Her photorealistic renderings of people and places, combined with surrealist compositions, create dynamic tension between the painting and the viewer.